I am really excited to be sharing this post today as a part of Keri's new eBook launch! 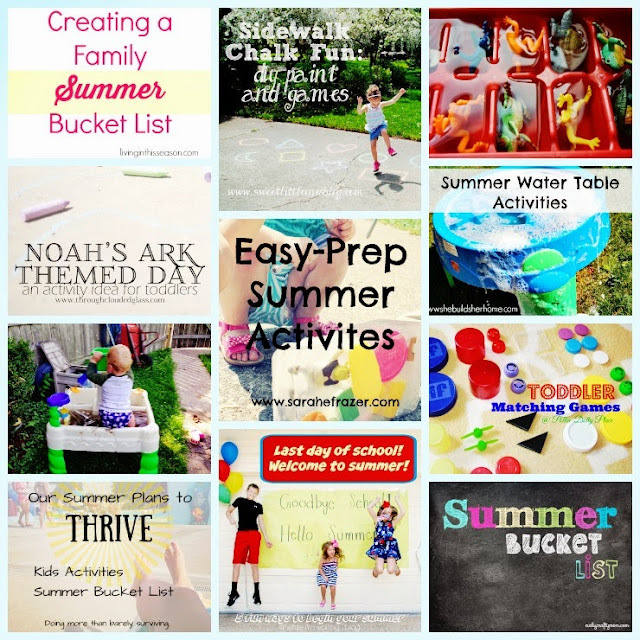 Be sure to check out the other awesome summer activity posts at the end of this post! We love our water table! It is great for if you don't want to fill up an entire pool (although sometimes my kids climb in the water table as if its a pool...), or when it isn't quite warm enough to run through those sprinklers. It is a lot more portable and so versatile! The best thing is that you don't need to have an actual water table. You can really do these activities with any kind of bucket or basin! When the girls were little, I would just find the biggest mixing bowl I had and fill it up with water for them to splash in and they had a blast with it. Squirt in some dish soap and fill it up for lots of bubbles and soapy water! Car/toy wash! This works especially well when its soapy. Kids think it is hilarious to wash their cars and trucks and trains and balls and whatever plastic toys you want them to wash. Cheap entertainment, folks! Put food coloring in the water and watch it change. Experiment with how many drops it takes to get the color you want or mixing 2 colors together to make a new one. Fill up your water table with sand and make a temporary sand box. Get the kiddos some scoops and cups and rakes to dig and create. Hide toy bugs or dinosaurs or anything else for them to find as they dig! Make your water table into a seasonal sensory box. In the summer, put different varieties of flowers in the table, or make an under the sea sensory bin in the table--put sand on the upper portion and fill the rest with shells, sea weed, plastic sea animals, etc. Let them make a garden in it! Put down potting soil and let them plant flowers or vegetables and tend to it. Real or fake! One of my favorite things about the water table is that it touches so many areas of kiddos development. Fine Motor: scooping, pouring, making shapes in sand, etc. Gross Motor: handling the hose and aiming it, climbing in or out of the table with supervision, helping dump the table out when you are done and more. Sensory: the water table touches all of the senses. Engage them and talk about how the water feels (wet, cold, warm, etc.). What does it sound like when you splash it? What about the water from the hose? How does the water smell? Does it smell different when it has bubbles than without bubbles? What does it look like? What color is the table? What color is the water? Is there anything in it? Maybe no tasting unless it is very clean water ;) Social and emotional: If your child has a sibling or playmate, the water table is a great place to talk about taking turns. It is a great learning opportunity for learning how to play kindly. Teaching them that maybe the other person doesn't want to be splashed. Things like that. Numbers, letters, colors, shapes, etc. 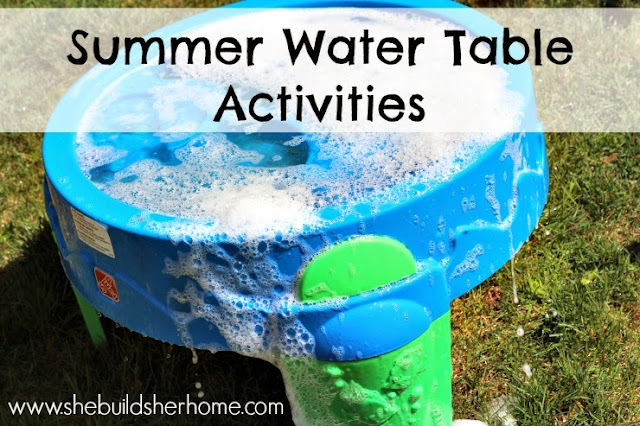 : You can incorporate all of these things into water play depending on the age of your child. Talk about what letters you see on the side, or what letter a certain toy in the table starts with. Ask them to count and see how long it takes to fill up the table, or to dump it out. Have them count how many things are in the table. Talk about the shapes of the items or the shapes of the table. Don't drill them, just let it flow naturally! Do you have a water table? What else do you do with it? Be sure to check out these other awesome summer ideas! And don't forget to check out Keri's e-book featuring great ideas for a thriving summer with your kids!